Pool(Underwater)That and take advantage of the field, thrill and excite the senses due to extensive underwater experience theme, encourage the growth and development of the child's brain. 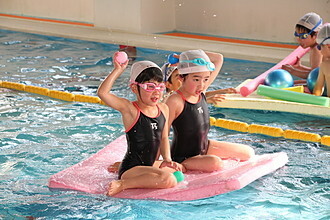 First, spread the range of activity in the water from fun water play, safety skill(Safe swimming)In a float that must learn "that" ensure breathing. After modern 4 stroke I have mastered, unleashes the potential of each.